Please sign the e-petition calling for the British government to secure the return to the UK of Shaker Aamer, the last British resident in Guantánamo. With your help, we can secure the 100,000 signatures needed by May 14 for Shaker’s case to be debated in Parliament. 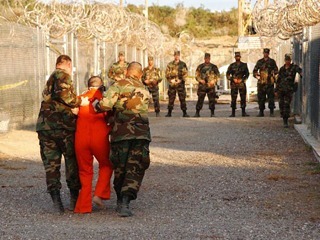 Shaker Aamer, a legal British resident with a British wife and four British children, has been held in Guantánamo for ten years without charge or trial. – The Bush administration cleared him for release from Guantánamo in 2007. – The Obama administration cleared him for release from Guantánamo in 2010. – The UK government under Gordon Brown requested his return to the UK in 2007. – The coalition government has been requesting his return to the UK since 2010. Shaker Aamer’s ongoing detention is, therefore, both inexplicable and unjustifiable. Please sign the e-petition, and help to publicise it as widely as possible, to put pressure on the British government to secure Shaker Aamer’s return to the UK. Last year the campaign for a fair trial for Babar Ahmad secured over 100,000 signatures, leading to a Parliamentary debate and high-level opposition to the extradition laws as they currently stand. The public was sympathetic because Babar Ahmad has been held for eight years without charge or trial. Shaker Aamer is held in Guantánamo, and not in the UK, but it is no less disgraceful that he has been held for ten years without charge or trial, and that his captors no longer even wish to hold him. The British government has run out of excuses. Help us demand Shaker Aamer’s return, to bring ten years of injustice to an end.